Regular service and maintenance of your transport wheelchair is vital to keep your wheelchair functioning smoothly. Routine servicing will make the chair roll smoother and better, thereby reducing the strain on your wrists and shoulders. Apart from that, proper and frequent maintenance will reduce the chances of a wheelchair breakdown and keep the user safe and protected from possible injury. If wheelchair upkeep is not done, parts may fail or stop functioning properly which can be potentially dangerous for the user. 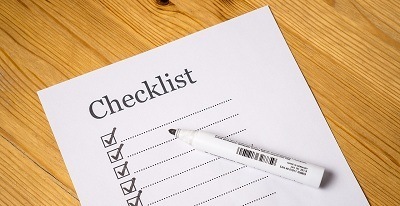 Here is a manual wheelchair maintenance checklist, which should keep the wheelchair functioning flawlessly and provide the user with many years of active mobility. This is essential to improving the wheelchair’s performance and extending its useful life. It should ideally be cleaned once a month, depending on the frequency of usage. Regular household cleaning products should do the job. Also cleaning the wheelchair provides the perfect opportunity to check for dents, cracks, scratches, loose nuts and bolts. If the pressure is below the mark, get it pumped up to the limit as printed on the side of the tire. This will keep the tires rolling with the least possible resistance. Also, examine the tires for punctures and cracked/worn out tread. If you notice any of these, get the damaged tire replaced soon. If they aren’t, lubricate them sufficiently with silicon spray, preferably not oil or grease. 1. Arm rests- See if any screws are piercing out of the arm padding. If there are any sharp edges or cracks on the pins, consider getting them replaced. 2. Arm assemblies- If they are detachable, ensure that they are tightened to just the right amount. Not too much and not too little. Also, check that the arm locks completely lock. If the arm is height-adjustable, check it's fluidity by locking and unlocking it and every available height position. 3. Side panels- Again, check for any sharp edges and make sure that the screws are tightly bound. 1. The upholstery should be tight from top to bottom. Check for any rips or tears. 2. The back brace joint post shouldn’t be bent or damaged in any way. 3. The hand-grips shouldn’t rotate on their posts and should have a tight and snug fit. 4. Check the hardware for loose joints. The safety belt shouldn't be frayed and worn out. This could be dangerous, and you need to get it replaced fast. 5. Recline the wheelchair all the way and see that it locks securely and tightly at every single position. 6. Check the slide lock of the hinged- back assembly to ensure that it works smoothly. 7. When folding, make sure there is no damage to the folding linkage at the spreader bar assembly. 1. Check that the wheel lock grips are tight and they prevent the tire from moving when the locks are applied. Also, check the condition of the rubber tips present on top of the wheel locks, that they are not split or cracked. 2. Check that the wheels spin straight and are not wobbly. 3. 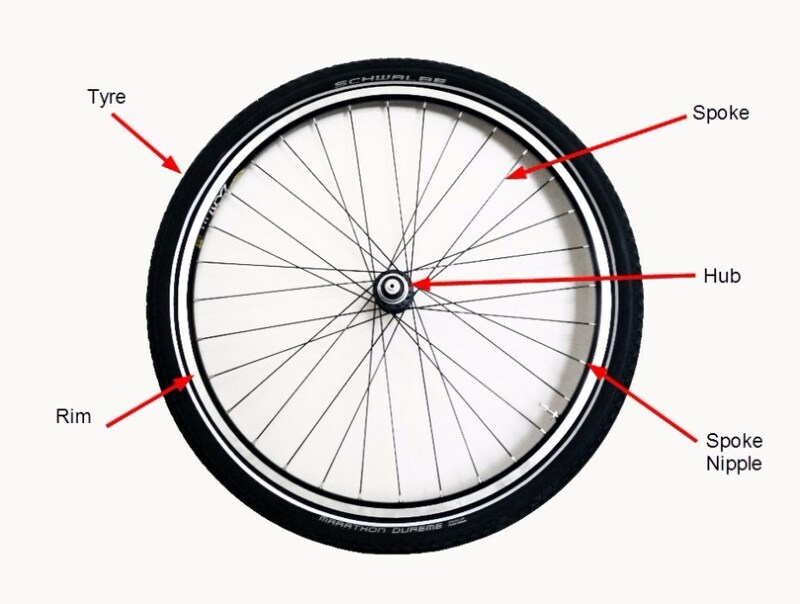 Strum all of the wheel spokes to make sure they are equally tight. 4. The hubcaps should be appropriately positioned. 1. Retaining Mechanism- The stem should be firmly attached to the fork. There shouldn’t be any signs of bending on the stem. 2. 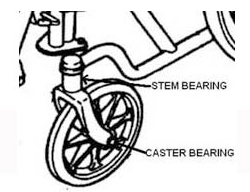 Stem Bearings- The casters should stay stable at high speeds, and there shouldn’t be excessive play in any direction. 3. Caster Housing- Place a roll check chair on a level surface. If the chair swerves more than a foot for a ten-foot distance, the frame could be damaged. Check the alignment of housing on the frame, the fork and stem to see if any of them are bent. 4. The wheel bearings shouldn’t wobble, and the tires should be secure on the rim. The wheels should have adequate air pressure. 1. The seat material shouldn’t be decayed or torn. Same goes for the carrying and lifting straps. 2. Front Post Slides- Fold the chair and see that it is straight on both posts. The posts shouldn’t come out of their sockets. While opening the chair again, see whether the posts rub or hit the caster forks. If they do, then the frame needs to be correctly positioned. 3. The seat rail should fit firmly into the seat rail guides. Also, check to see if all four wheels are coming in contact with the ground evenly. If not, there might be a faulty joint somewhere, or the frame is bent. 1. Engage and release the lock mechanisms to ensure they are functioning flawlessly without any jerks. Check for excessive wear and tear everywhere in the mechanism. 2. Footplates- The springs should be able to affix the foot plates at every available position. There shouldn’t be any sharp edges on the footplates. The footrest length adjuster should move freely, and the fit of the footplate on the length adjuster should be firm and tight. 3. The leg rest panels and straps should be totally free of sharp edges, cracks and fraying. 4. The leg rest adjustment rod should lock safely in every position. All the hardware should be present and be working smoothly. 5. The foot rest bumpers should be in their proper place. They shouldn't be worn out or dislocated. The angle for the footplate should be ideal and correct for the occupant. This wheelchair maintenance checklist seeks to identify and resolve the most common issues associated with wheelchairs. Injuries and accidents can be prevented with these routine maintenance and inspection checks. Knowing your own wheelchair functionality is very important for your safety. For specific maintenance suggestions on your own particular wheelchair, please refer to the User Manual issued along with it. However, if you are ever in any doubt about the proper functioning of whatever component of your wheelchair, it’s best to get it checked out immediately.